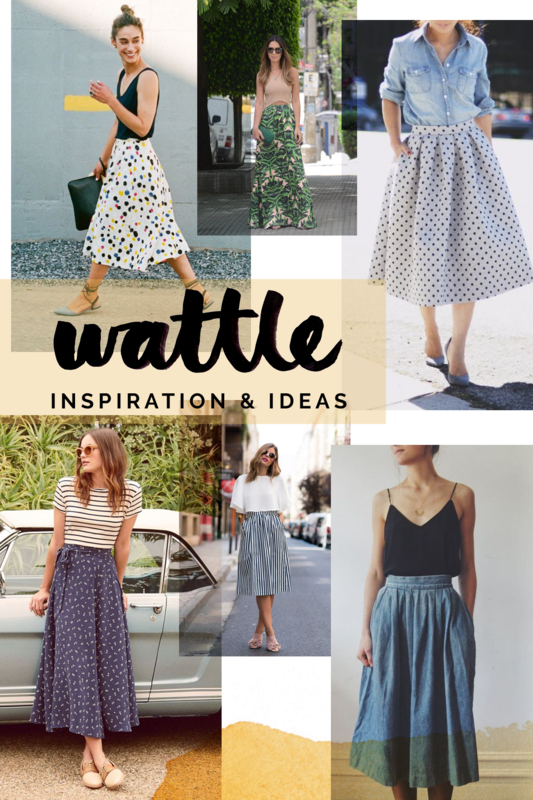 The Wattle skirt is one of those patterns you’ll find yourself making over and over again in different lengths, new fabrics, changing up the closure or the waist band! 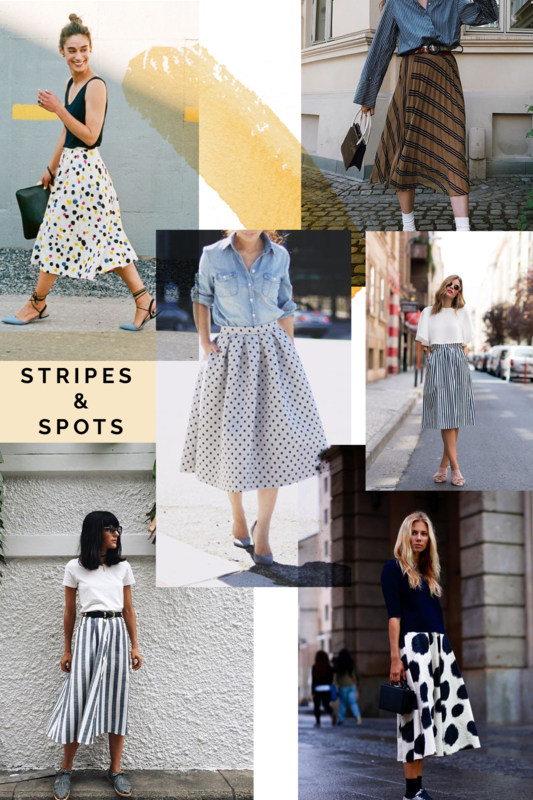 There are really an endless stream of options available whether you prefer more or less volume with pleats or perhaps a bow at the side; a sleek bias cut midi in a floral pattern or a maxi for a special occasion; or even a play on the perfect summer basic, the denim skirt. You’ll be spoilt for choice! Find a striped fabric and test out your pattern matching skills or completely go against the grain and place your stripes in opposite directions! The perfect girly skirt to contrast with a comfy denim shirt or t-shirt is ANYTHING with polka dots. Small dots, large dots, colourful dots, textured dots…they’ll add the perfect amount of fun and femininity to your look. Use a heavy weight fabric with embroidered stripes or dots to give structure and volume to your skirt. 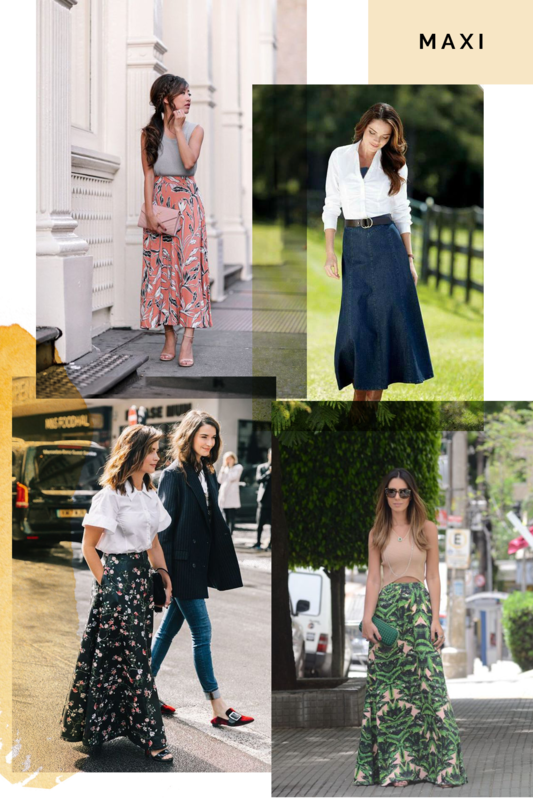 Florals on a skirt are about as groundbreaking as florals in spring…however they certainly never go astray. Add a striped top and you’re immediately in Spring/Summer, feminine/chic territory. Extend your skirt length for a beautiful elegant silouette, add heels and you’re ready for a night out. Extending the Wattle skirt to the floor is a version we’re desperate to try! The sleek lines of bias cut View A and D are the perfect base to add length and keep a smooth line over your waist and hips. Use a heavy weight denim for a modest longer skirt perfect for day time. 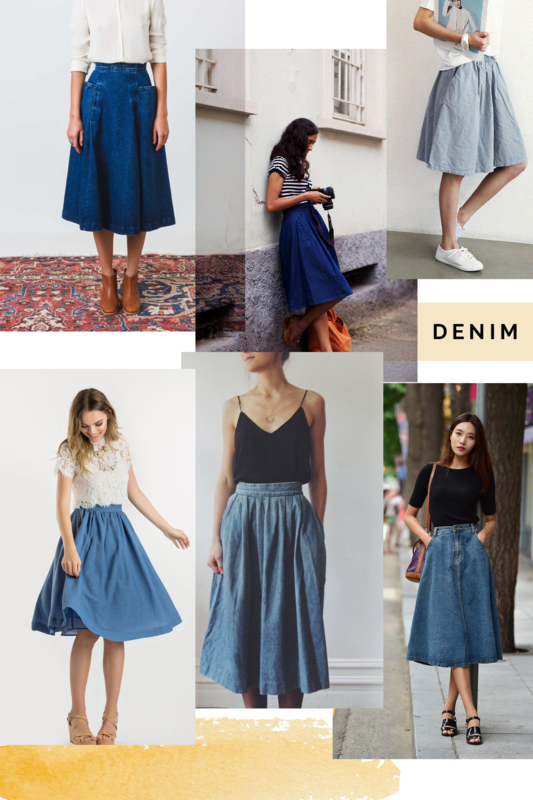 Create a structured bias cut skirt in thick denim for a vintage look. A lighter weight denim would be darling in any of the versions but especially the pleated and gathered view B and C. Incredibly comfortable you could pair it with almost any top and shoe…the perfect basic. The Wattle tester round was truly one of our favourites, we had so many beautiful makes come through in all variations. 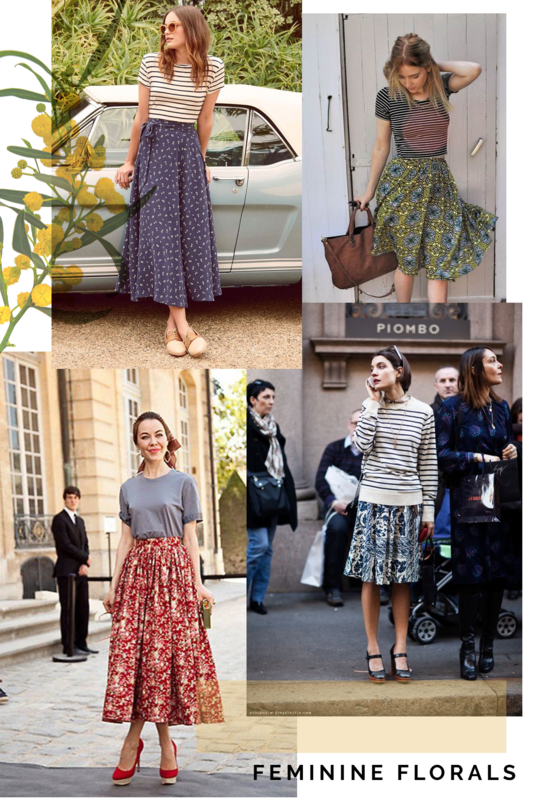 The versatility of the pattern is really shown by how different everyone’s skirts turned out! 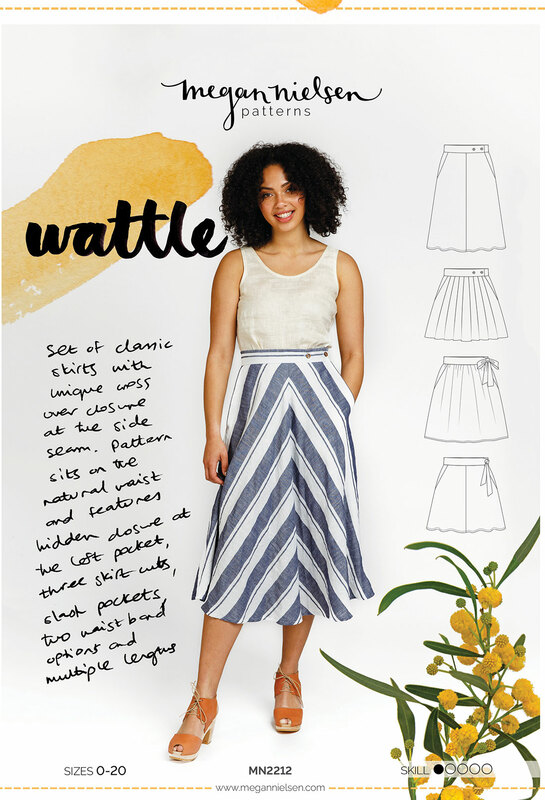 Our wonderful testers have agreed to let us share their makes with you and I have no doubt you’ll love their Wattle skirts as much as we do. The Floreat dress & top is one of my favourite patterns we’ve released of late. It’s comfortable and feminine but it’s the versatility I’m super duper excited about! Sometimes I look at my own makes using this pattern and I feel like it’s hard to tell they all come from Floreat! 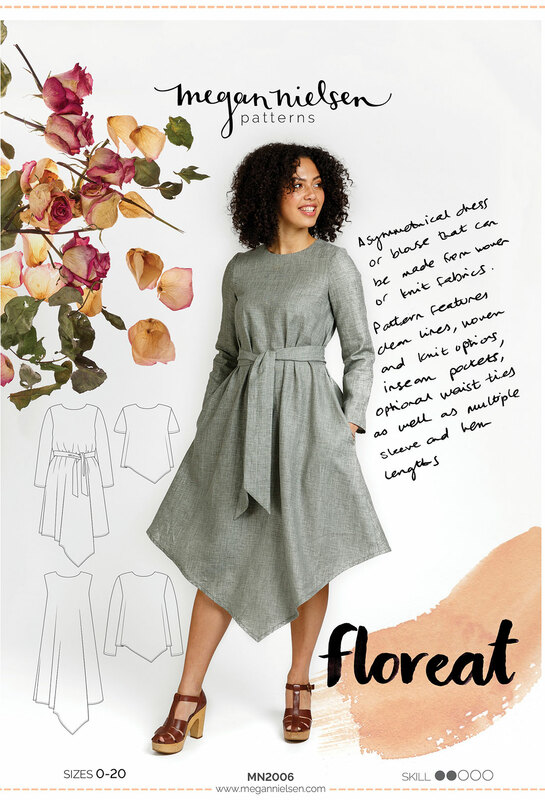 Floreat includes woven and knit versions, which of course means our inspiration board was overflowing with ideas on how to style, alter and customise dresses and tops. 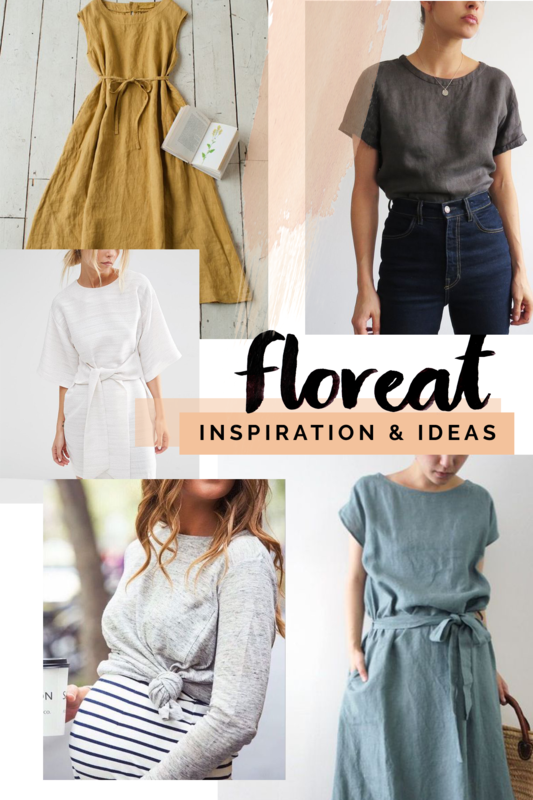 Take a look at our favourite inspiration images and make sure to make note of any ideas you love for your Floreat! 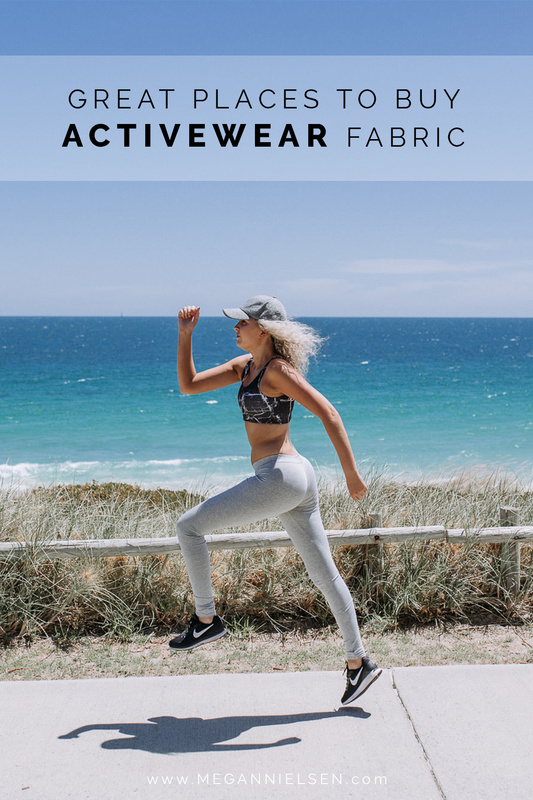 Use a super lightweight fabric and use as the perfect layering piece over leggings. Use a contrast colour fabric on the end of the waist tie as a feature. Make the ties extra thick to create a comfortable unique feature to the dress that will highlight your waist. Knot the asymmetrical point on the front hem of your knit top. Extend your woven Floreat further down the leg and straighten the hem to create a midi/maxi loose fitting dress. Sew your tie separate from the dress and tie it loosely around your hips instead of the waist for a different look. 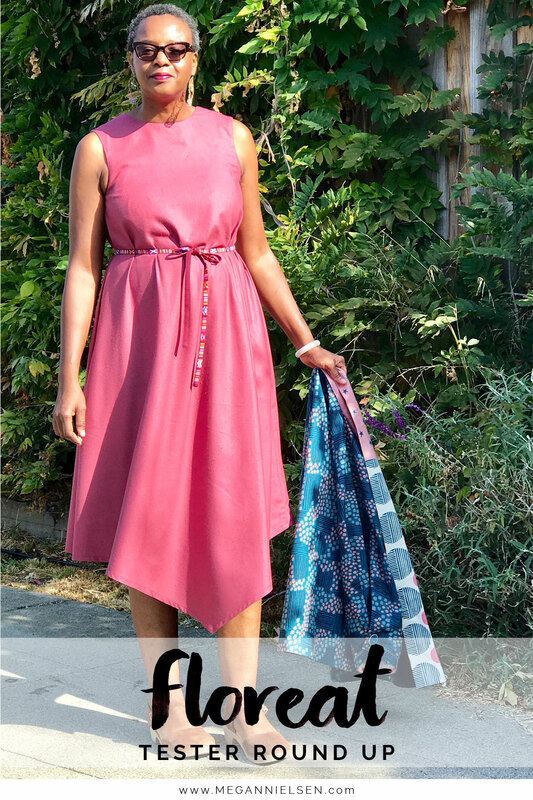 If you’re after an oversized fit, create an extra long tie in self fabric and wrap multiple times around your waist allowing the dress to blouse over the top. Pair with some sandals and jewellery…you’ll feel grecian chic in no time! 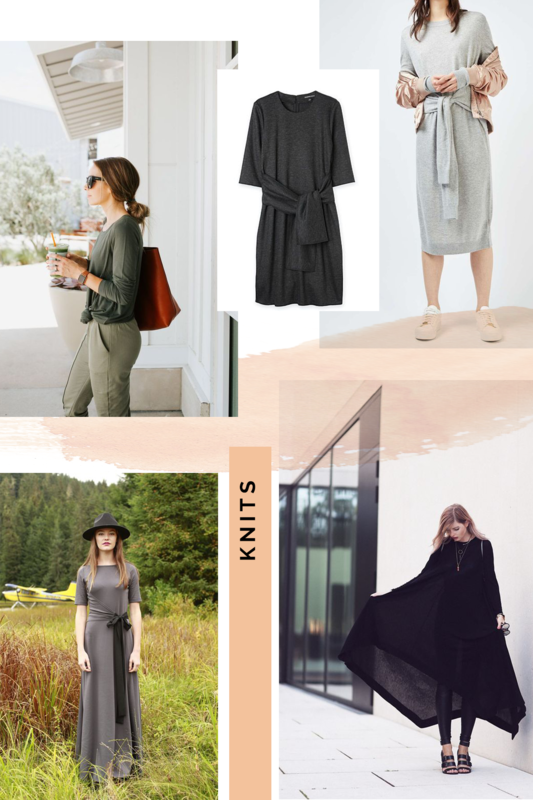 Oversized knit dresses are perfect for the winter months, leave the hem with the asymmetrical point to make layering a breeze. Use a super thin waist tie or remove the tie all together on a sleeveless Floreat. 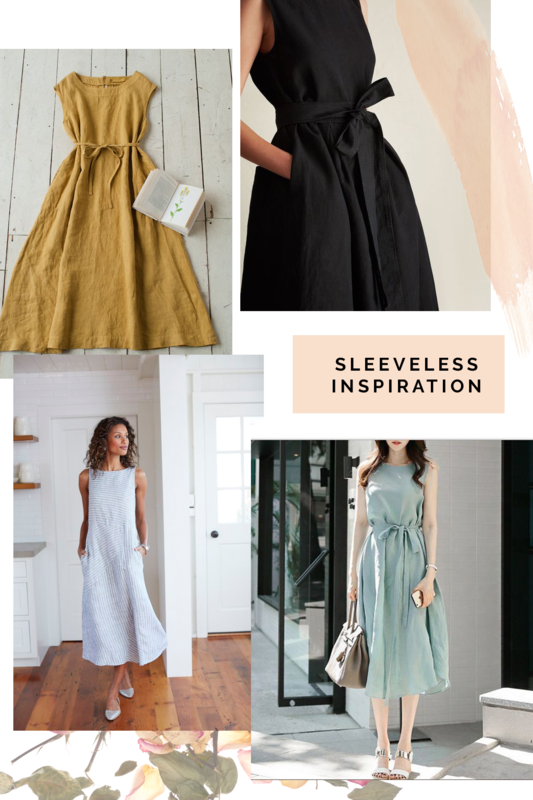 Use a heavier weighted linen or light cotton to create the perfect summers dress. Using more luxurious, flowy fabrics give this dress a glamorous edge. Don’t think of it as just a day dress…this version could easily be a sleek cocktail dress for the evenings with the right fabric choice! 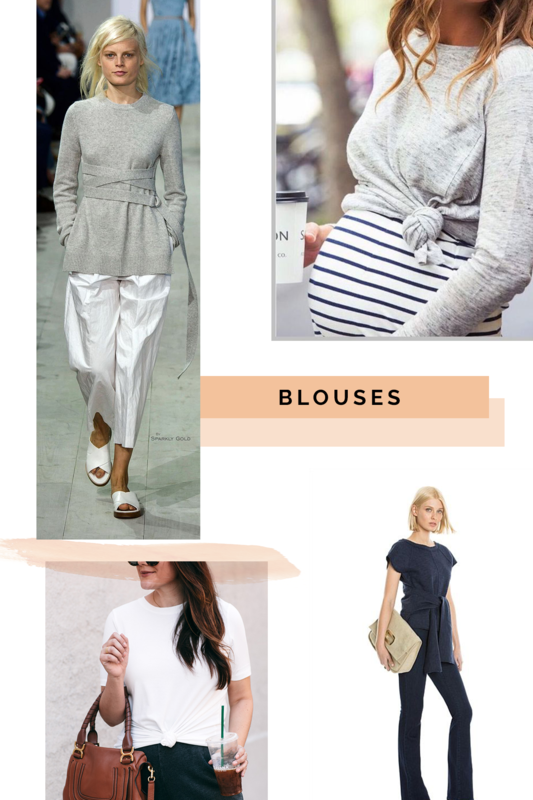 A long sleeve knit Floreat is perfect for maternity styling, tying just above the bump. A woven blouse with ties is such a classic look with pants and heels. Extend the top for a longer silhouette. Floreat makes the perfect basic tee, with a slight tie variation on the hem.